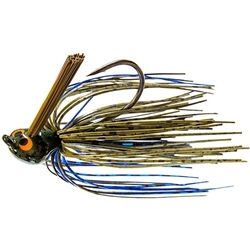 Designed by Bass Elite Series Pro and noted jig fishing specialist David Walker. Built around heavy duty 4/0 VMC flipping hook. Unique head design excels around all types of shallow water cover. Hand-tied 100% silicone skirts and wire trailer keeper. Durable, color matched head paint schemes and hallmark 'crosseyes' for added attraction.